Members of the Cedarville University men’s basketball team hold the championship banner after winning the NCCAA national title game, March 16 in Winona Lake, Indiana. WINONA LAKE, Ind. 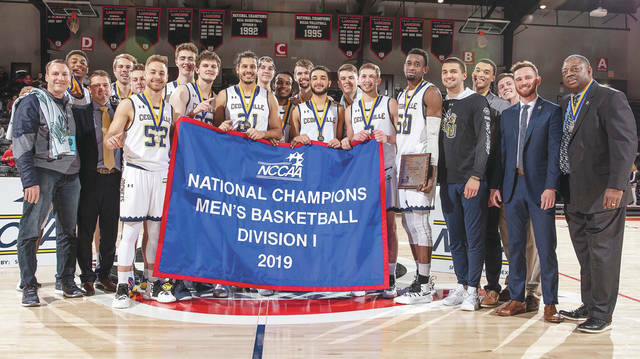 — Cedarville University claimed its second National Christian College Athletic Association (NCCAA) DI Men’s Basketball National Championship (2012) with the 64-58 win over No. 2 seeded Roberts Wesleyan College (N.Y.). Cedarville, the tournament’s top seed, trailed 23-4 with 9:45 left in the first half, but the team was able to battle back to a 26-26 tie at the break, and the game remained close the rest of the way. CU inched out to a seven-point advantage with 10:30 to play, but Roberts recovered for a 56-52 margin at the 4:45 mark. Following a pair of Grant Zawadzki free throws, back-to-back three-pointers by Colton Linkous completed an eight-point spurt with a minute left to give the Jackets the lead for good. Conner TenHove led the Yellow Jackets with 14 points and five rebounds, while Colton Linkous finished with 12 points and five rebounds. In the Yellow Jackets’ first round game against No. 8 Nebraska Christian College, Branden Maughmer led the way with 20 points, five assists, and four rebounds in the 80-58 win. Cedarville then defeated No. 4 Bluefield College (Va.) 72-59 in the semifinals as TenHove finished with 20 points, seven rebounds and three assists. TenHove was named the tournament’s Most Outstanding Player. https://www.fairborndailyherald.com/wp-content/uploads/sites/50/2019/03/web1_NCCAAChamps_PS.jpgMembers of the Cedarville University men’s basketball team hold the championship banner after winning the NCCAA national title game, March 16 in Winona Lake, Indiana. Information obtained from the NCCAA (thenccaa.org) and Cedarville University athletics (yellowjackets.cedarville.edu).